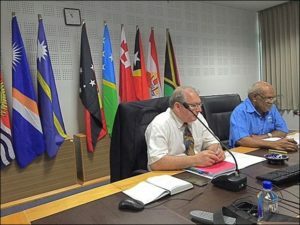 The Pacific Islands Development Forum on Monday 16th March 2015 hosted a Talanoa Session on the subject of Flags of Convenience for a number of Pacific Ambassadors at the PIDF Secretariat in Nasese, Suva. Briefing the meeting were two visiting independent observers to the International Maritime Organisation (IMO) Mr Bill Hemmings (Transport & Environment) and Mr John Maggs (co-author 3rd IMO GHG report) from the Save our Sea coalition. “The transport sector (land, air and marine) is the largest user of fossil fuels in the Pacific, accounting for at least 70% of all Pacific Islands Countries (PICs) use. For PICs, sea transport is a significant, and in some cases the majority, user. Electricity generation, in comparison, uses around 20% of fossil fuel. Most efforts to introduce low carbon alternatives have focused on electricity generation and the need to decarbonise Pacific island transport has yet to be addressed. The meeting today is part of our efforts to address this important issue. International shipping was not included in the Kyoto Protocol and has played very little role in UNFCC negotiations, the responsibility for GHG emissions from shipping being left with the IMO through its Marine Environment Protection Committee (MEPC). The only MEPC meeting in 2015 will be held in London in May prior to the UNFCCC meetings in Paris in December. 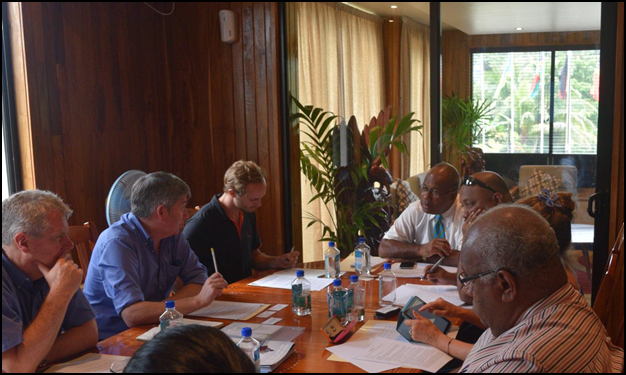 The meeting today provided an opportunity to exchange information on how the Pacific can participate effectively in the upcoming MEPC meeting in London in May.